Fly | Pump That Pedal - We've got it, You want it, Come and get it. Angel is on the phone with her man and is telling him that the back way she is taking to his place is muddy and she’s not sure if she can make it through. 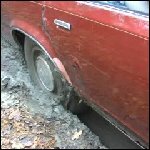 She proceeds and finds her Lincoln stuck in the mud. She spins and spins and rocks…. Our realtor, Angel, is checking in on a property but can’t remember where it’s at. She calls her boss to get the address and then heads that way. Once there, she calls her boss again to ask if she can make it onto the property because it’s muddy. They both…. Angel was out taking her dog Max for a walk when he managed to slip away into the woods. Needing to leave for work, she hops in her car and drives her land to look for him. She ends up on a muddy trail and gets her BMW stuck in…. This is a short, supplemental update in which Angel is driving as I film. I comment on the surrounds (deserted vehicles, bumpy roads, narrow passageways, etc), and before the end of the video, the car gets stuck. This is footwell shots only. This is a short, supplemental update we got with Angel when she was stuck and backing up. Angel doesn’t think she’s going to make it through the passageway she’s trying to drive down. So instead, she starts backing up. She gasps in horror when her car sinks into ruts already left behind by someone else. Fortunately, she’s able to work with the situation and get herself unstuck. Angel and I decide to turn around, and the spot is super tight! She’s not used to driving a big car, so it takes her a while to turn around. The car dies on her once, and the look on her face is genuine. She gets it started, and then….